Dolly Ki Doli (transl. Dolly's palanquin) 2015 Indian comedy-drama film, directed by debutant Abhishek Dogra and produced by actor Arbaaz Khan under his production house Arbaaz Khan Productions. The film stars Sonam Kapoor in the title role and also features Pulkit Samrat, Rajkummar Rao and Varun Sharma. The film was released on 23 January 2015. The film's trailer was unveiled on Malaika's and Arbaaz's anniversary in December 2014. The movie centres around a young woman, Dolly (Sonam Kapoor), who is a young con artist. First she married Sonu Sherawat (Rajkummar Rao). She marries men from different religions and runs away with their wealth on the night of the wedding. Her entire family consists of con artists. After conning a number of rich men, she gets media attention, who label her as "looteri dulhan". A cop Robin Singh (Pulkit Samrat) decides to catch Dolly. When she tries to con Delhi boy Manjot (Varun Sharma), she slips and her photographs are splashed all over the media. All music composed by Sajid-Wajid and lyrics are penned by Irfan Kamal. The film received mixed reviews from critics.Bollywood Hungama described the film "a solid entertainer that will surely entertain the masses and classes alike" and gave it 4.5 out of 5 stars. In its first Friday, it collected 2 crore, a result which Koimoi called "poor". At the end of its second weekend, it had collected 19.21 crore, performing well in the north, but failing in multiplexes and single screens. ^ "Dolly Ki Doli". bollywoodhungama.com. ^ a b "Dolly Ki Doli: 2nd Friday & 2nd Saturday Box Office Collections". Koimoi. ^ "Sonam Kapoor's Dolly Ki Doli To Release On January 23, 2015". Indialive.today. Retrieved 11 July 2014. ^ a b "Exclusive: What's Sonam Kapoor Wearing In 'Dolly Ki Doli'?". The Huffington Post. Retrieved 14 January 2015. ^ "'Dolly Ki Doli' escapes CBFC knife and gets U/A certificate". Daijiworld.com. 12 January 2015. 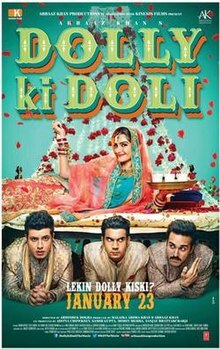 ^ "Dolly Ki Doli Movie Review". The Times of India. ^ Bollywood Hungama. "Dolly ki Doli".